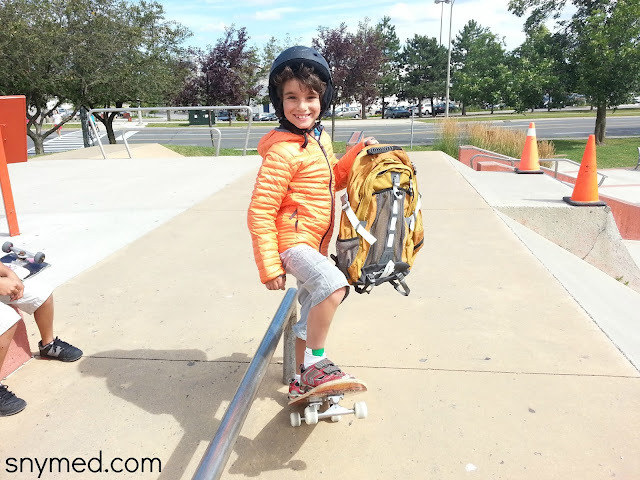 Eddie Bauer Has Kids Covered for Back-to-School & CONTEST (~OVER~)! Eddie Bauer Has Great Kid's Gear & Clothes For Back-to-School! I first wrote about my 20-year affair with Eddie Bauer, sang the virtues of Eddie Bauer's Travex line, and modelled some of the Eddie Bauer summer line. But, Eddie Bauer also has a great kid's line for fall, winter, and back-to-school! Check out the Boys' MicroTherm Down Hooded Jacket from Eddie Bauer, shown in bright orange above (also available in bright navy). It features 550 fill premium goose down and "a micro-channel design that provides superior performance and ultralight comfort for active kids". If you are in Canada, I would say this is the perfect fall jacket, or light winter jacket for your son. I love that the jacket has a hood, as it gets so cold and windy in the fall. This will be my son's back-to-school jacket, and he can't wait to wear it regularly! It retails for $99.95 on EddieBauer.com. Sizes in this jacket range from XXS - XL (sizes 3/4 - 14). My son's backpack needed to be replaced this year, so I opted for the Eddie Bauer Adventurer Backpack in spice (orange). It retails for $89.95 on the EddieBauer.com website. He has been really pleased with this backpack, and it is one of Eddie Bauer's largest daypacks. There are all kinds of great compartments and nooks and crannies in this backpack! 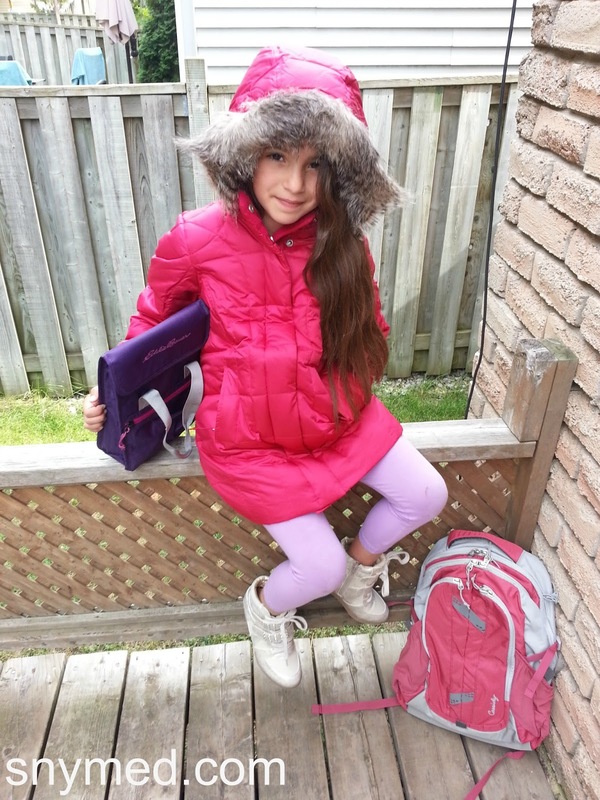 I ordered the Girls' Lodge Down Parka in cerise (dark pink) for my daughter, shown above. It retails for $129 on the EddieBauer.com website. If you love the lady's version of the best-selling Lodge Parka, you will love this for your daughter! It features 550 fill Premium European Goose Down, snap-off hood with detachable faux fur ruff, a fleece-lined collar, storm cuffs and more. Yes, it's machine washable! I like that it covers the bum, falls around mid-thigh, and will keep my child warm this winter. Sizes in this jacket range from XXS - XL (sizes 3/4 - 14). Browsing EddieBauer.com, I selected the Women's Cassidy Pack in berry (reddish/pink) to go with the Lodge Down Parka in cerise. It's not too bulky, and a slimmer fit than the Adventurer backpack. I'm certain it will hold all my daughter's books and lunch when she returns to school in September! It retails for $79.95. Also shown in the photo is the Eddie Bauer Lunch Bag Cooler in concord (purple). I love that it's made of Eddie Bauer's famous rip-stop fabric for durability, and that it's insulated to keep lunches the right temperature. The lunch bag's handle makes carrying a breeze! I liked the lunch bag so much, that I ordered the same one in aqua for my son! Retails for $19.95. WIN an Eddie Bauer Jacket For Your Child! WINNERS: Deborah D. & ...second winner to be announced shortly! 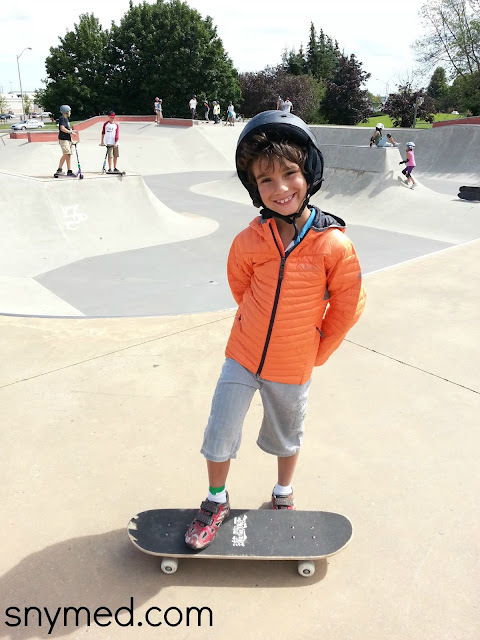 WIN a FABULOUS Eddie Bauer jacket for your son or daughter! I am giving away one lucky winner their choice of a Boys' MicroTherm Down Hooded Jacket OR a Girls' Lodge Down Parka! Contest open to Canada and the US, and ends Tuesday September 3rd, 2013--just in time for back to school! Leave a COMMENT below stating if you ever knew that Eddie Bauer sells kid's fall and winter jackets on EddieBauer.com OR what kind of winter weather you usually get where you live! Then, use the entry form below to enter. GOOD LUCK! I didn't realize that Eddie Bauer sells kids jackets. They look awesome! I def did not realize they sell kid jackets. I bet theyre super warm which would be awesome with our freezing winters! I did not know that they carried jackets for kids. I really like that orange one & how it fits. I had absolutely no idea that they sold kids stuff!! I've never seen it instores...online only? I had no idea that Eddie Bauer carried children's clothes! Good to know! I never knew. They are very stylish just like everything Eddie Bauer. I never knew. They are very stylish though like everything Eddie Bauer! I didn't know they sold kids clothes at all! Thanks to the help of bloggers I knew they sold kids clothes. I never knew this but I will check them out. I did not know that EB sells kids winter jackets, and where I live it feels like winter all year round. I didn't know they made kids jackets. Winter in Ontario is usually cold and long, it's a damp cold. I had absolutely no idea that Eddie Bauer sold kids jackets. I live in Ontario and we do often have very cold winters with lots of snow. So we all need to be prepared for all kinds of weather. I had no idea that Eddie Bauer makes kid's clothing at all! I have never seen any Eddie Bauer kids clohes. I wonder when they started selling Kids clothes. I did know that Eddie Bauer sold kids jackets, but they've always been a little outside our price range. My son would love one, though! I knew that Eddie Bauer sold kids jackets, but they've always been a little outside our price range. My son would love one, though. I didn't know that Eddie Bauer sold kids jackets, they look great. I did know that Eddie Bauer sold kids jackets. We have a young daughter and I didn't know that Eddie Bauer sold winter and fall jackets. Looking forward to checking them out! I did not know about Eddie Bauer's kids' winter and fall jackets. Looking forward to check them out! I always associated Eddie Bauer with the vehicle, but once I started shopping at Target, I noticed Eddie Bauer interior accessories for children, such as seat protectors, sun shades, etc. I'm not sure I knew about kids' clothing, although at some point I probably knew they made adult items. I live in Florida, and lately our winters are unusual, but we do have days when we need something heavy. Great promo...keep up the amazing work. I haven't been in an Eddie store in years! I had no idea that they had kids stuff! Now I am going to have to check them out again! I had no idea they had such nice kids coats! I'm going to have to bring my daughter in to try one on! I did not know that Eddie Bauer carried children's jackets...they are very nice! Didn't know they had kids clothes, cute! I had no idea that Eddie Bauer sold anything kids! I had no idea that Eddie Bauer sold any kids stuff at all! We get a couple months of greyish cold weather and a couple months of snow where I live. A coat like this would be very handy for my son! we get freezing cold winter weather here,,a nice warm winter jacket would be nice! I really love the Boys' MicroTherm™ Down Hooded Jacket!!! I had no idea they even sold kids clothes!!! I did not know that Eddie Bauer sold kid jackets. Would be great for the winter months here in Canada. Eddie Bauer has always been one of my favorite places for kids clothes. I didn't know that Eddie Bauer sold kid's fall and winter jackets. I had no idea Eddie Bauer sold kid's jackets. Good to know! These jackets look super warm! I wish I knew Eddie Bauer sold these a long time ago! This is what I've been missing! I did not know Eddie Bauer sold kids jackets! Nice! Their jackets are so cool and cute. They are also known for producing durable clothing, so I hope that is passed on to the kids' department. I did not know that they sell kids jackets. I didn't even knew that they had kids clothing! That's awesome, thanks for the giveaway! Toddler Boys' Fast Fleece 1/4 Zip Pullover is really nice would love this for my son. We get the cold but dry winters. I found out they did last winter or winter before last. We usually have wet winters. Hoping for more snow this year! Really nice winter clothes for kids - I wasn't aware! We get -40 winters here, it is so hard to find them anything appropriate. I didn't realize they sell kids jackets. I never knew this . Thanks. I, too, had no idea that they carried kids' coats! I did not know they sold kids jackets or coats! I knew they carried jackets for kids but they are way out of my budget! I didn't know they sold kid's clothing. Toddler Boys' WeatherEdge® Rainfoil® Jacket looks great I shop at Eddie for myself & Hubby Didn't realize they were carrying kids clothes too. I live in the Maritimes and we usually get a lot of snow in the winter. been looking at the kids site too. Resolve Tip Exchange & CONTEST! Monsuno: Power (Volume 2) on DVD!